Kingston introduces its next-generation flash storage products and new Mobile LifeStyle Series accessories at CES 2018. Kingston’s new Mobile LifeStyle products include the new Nucleum 7-in-1 USB Type-C Hub ideal for Macbooks and ultrabook users with extra USB-A and USB-C ports along with HDMI and SD/microSD card slots. Kingston also introduces the new DataTraveler Bolt Duo with USB-A and Lightning connectors. 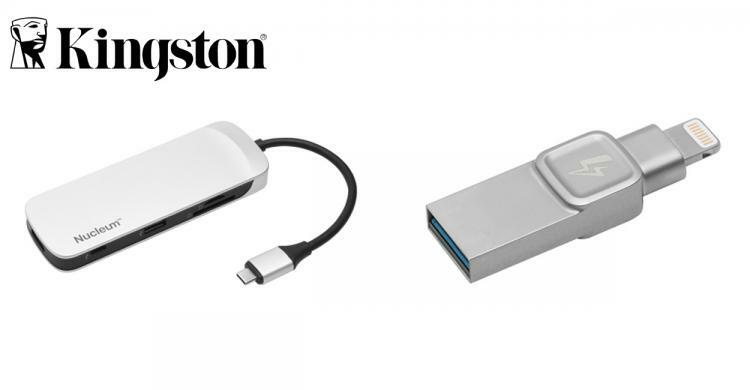 The Kingston Nucleum is built to expand MacBooks and ultrabooks with limited connectivity options to accommodate peripherals, external storage devices, monitors and others. Users can be more productive as all seven ports can be engaged at the same time. Nucleum users can power up a MacBook while also running an external hard drive and charging an iPhone simultaneously. The Bolt is an easy solution to expand the storage space of your iPhone and iPad where you can simply plug, save and transfer data with ease. The Kingston Nucleum is now available in the US and UK with an MSRP of $79.99. The DataTraveler Bolt Duo is also now available in 32GB, 64GB and 128GB capacities with an MSRP of $59.99, $89.99, and $119.99 respectively.